IBASSIN: Tom Monsoor Wins 2017 Walmart FLW Tour Potomac River 66-11lbs! Tom Monsoor Wins 2017 Walmart FLW Tour Potomac River 66-11lbs! They say turnabout is fair play. Tom Monsoor certainly agrees. 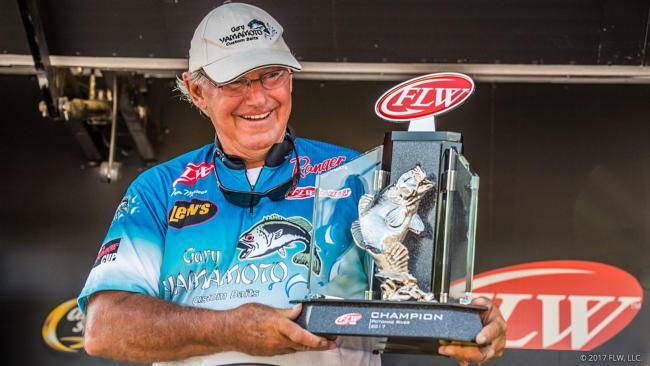 Four weeks ago, the La Crosse, Wisc., pro was considered a favorite to hoist the trophy on his home waters of the Mississippi River. Instead, he watched Potomac River stud Bryan Schmitt hold it up while he sat at home, having finished a disappointing 105th. On Sunday, those roles were reversed. The favorite, Schmitt, sat on the sidelines as Monsoor did just enough to hold off a number of hard chargers to win the FLW Tour on the Potomac River presented by Costa Sunglasses. Monsoor’s winning weight of 66-11 bested tour rookie Chad Warren of Sand Springs, Okla., by a mere 5 ounces. Monsoor put the field on notice on day one when he cracked 19-6 to start in second, and he took the lead – for what ended up being for good – on day two with a bag of 16-14. Still, Monsoor saw his weights fall every day of the event, and with it his lead. After a 3-pound cushion on day two, he was a mere 2 ounces over Brandon McMillan of Clewiston, Fla., heading into the final day. Monsoor didn’t mince words following Saturday’s performance, saying the better quality of his two-area pattern seemed to be done, as too much fishing pressure on the previous days had beaten up the weed flat in Quantico Bay. On days one and two, he’d been able to catch some key 4-pounders and cull out the majority of his morning fish in the area. Fortunately, his quantity spot – a 100-foot weedbed near Mason’s Neck – continued to produce despite wind, waves and deteriorating water conditions in and around it. Each of the four days he went to the spot, put down his Power-Poles and methodically worked his way through the area with his infamous black-and-blue swim jig. As the fishing got tougher, he also mixed in a Yamamoto Swim Senko and a Yamamoto Senko the final two days, but he never weighed in a fish he caught on either. On Sunday he again caught a quick limit, but with high winds causing significant waves on the main river, Monsoor’s only option was heading back to Quantico for one last go-round. He says it was lucky it worked out that way. “At around 1:30 p.m. I caught two good ones on back-to-back casts,” says Monsoor. One of those ended up being a near 4-pounder, and both edged him up just over the 15-pound mark to beat out Warren. The victory was a long-time coming for Monsoor, who has fished the tour since 2002 yet never won an event. The closest he came was in 2004 at the Atchafalaya Basin, when he actually had the highest cumulative weight at the end, but the format then involved zeroing out the weights after two days, and he finished second. He never forgot about that event, as he’s long said winning a Tour event was “important” to his life. After 15 years, he says he’s complete. “I said I could die tomorrow and be happy, and I meant it,” says Monsoor. “I don’t want to, obviously, but I’ve had a good life.